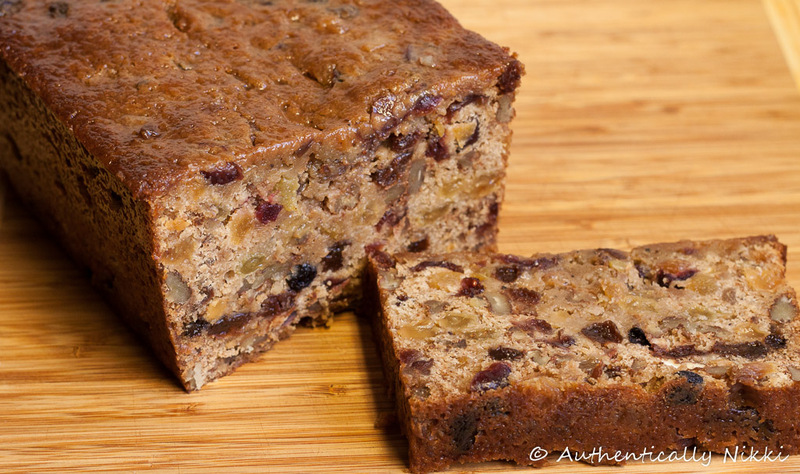 Assemble and bake the fruitcake 4-6 weeks before serving. Make the rum simple syrup by adding the water and sugar to a small saucepan over medium heat. Stir occasionally until the sugar is completely dissolved. Do not boil. Let cool to room temperature and stir in the rum, one tablespoon at a time, tasting after each tablespoon. Make it as strong as you like. Store in a small container with a lid until needed. Combine the dried fruits, crystallized ginger, lemon zest, orange zest and rum in a 5-7 cup plastic storage container with a tight fitting lid. Shake well and let sit on the counter for 24 hours. Give the container a shake every time you walk by or think about it. Into a large saucepan, add the contents of the dried fruit mixture, the granulated sugar, butter, apple juice and spices. Bring to a boil, stirring occasionally. Reduce the heat, cover and simmer for 10 minutes. Remove from the heat and let cool until room temperature. Heat oven to 300 degrees. Spread the chopped pecans or walnuts out onto a cookie sheet. Toast for 10 minutes stirring every few minutes until light brown and fragrant. Cool to room temperature. Turn oven up to 325 degrees. Grease a 9 x 5 inch loaf pan (or 6 mini loaf pans) with non-stick cooking spray. Whisk together the flour, salt, baking powder and baking soda. Add to the fruit mixture and stir well with a wooden spoon. Add eggs, one at a time, stirring until each egg is fully integrated. Fold in the toasted nuts. Spoon the batter into the prepared pan(s). If using mini loaf pans, you can use a scale to evenly distribute the batter. Each loaf pan will need approximately 320-330 grams of batter (about 11 1/2 ounces). Bake the large loaf pan for 1 hour or the mini loaf pans for 30-35 minutes. Insert a wooden skewer or knife into the center of a cake. If it comes out clean, then the fruitcake is done. If batter is sticking to the skewer, bake for another 5 minutes and check again. Remove the cake(s) from the oven and set on a cooling rack. Baste the warm cake(s) with the rum simple syrup (or gold rum or brandy). You will not need all of it right now. Let cool to room temperature. If you are using disposable aluminum baking pan(s) you can leave the cake(s) in the pan(s) and cover tightly with aluminum foil. If using metal baking pan(s), you can remove the cooled cake(s) and wrap tightly in plastic wrap or aluminum foil. Store in the refrigerator for 4-6 weeks and at least once a week, unwrap and baste with more rum simple syrup (or brandy or rum). This entry was posted in Cake, Food and tagged Christmas, dried fruit, fruitcake, gifts, holidays by authenticallynikki. Bookmark the permalink. Mmm I love fruit cake, this looks so lovely and delicious!